Tamilnadu 878 forest guard recruitment, apply for 878 forest Department , Tamilanadu forest Department 2018, apply for tamilnadu Forest Department, How do apply for tamilnadu Forest Department, 878 Vacancy for tamilnadu Forest Department forest guard. Tamilnadu Forest Department has released a notification for 878 posts for Forest Guard. It's a golden chance for all Youngsters who want to get a government job. Tamilanadu forest guard department has released out their notification out , details by sachinkiblog who gives latest updates of all best government jobs. 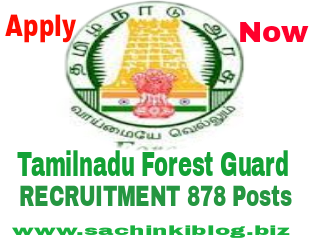 Tamilnadu Forest guard department 878 posts recruitment apply now. We are providing some important and quick Details about recruitment . Details by sachinkiblog - latest government jobs 2018-19. *Fees will be paid with both methods ( online and Offline) by e-challan. Forest Guard :- Candidate should have 12th Passed with physics, Chemistry , Biology And Zoology etc. Forest Guard (with Driving license) :- candidates should have 12th passed with Physics,Chemistry , Biology and Zoology etc. And must have a Clear Driving license with minimum 3 Years experience. Height for female and Transgender :- 150 cms.